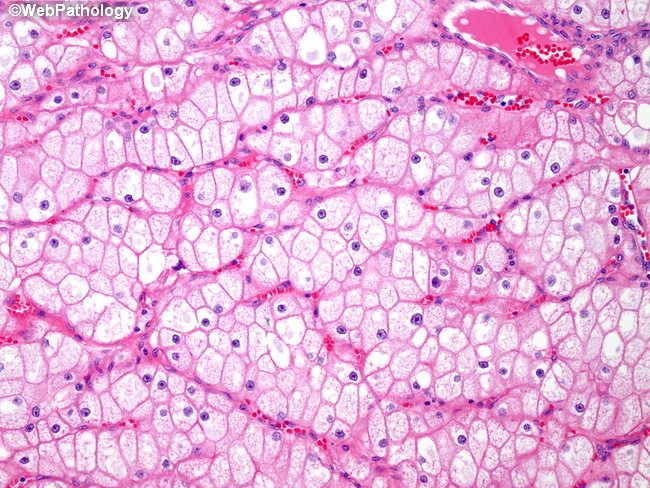 An alveolar pattern is seen in this example of chromophobe renal cell carcinoma. The pale pink cytoplasm and elaborate vasculature may mislead the unwary to the diagnosis of clear cell renal cell carcinoma, but notice that very few cells have the optically clear cytoplasm seen in clear cell renal cell carcinoma. Instead the tumor cells have a finely reticular cytoplasm and the cytoplasmic membranes are distinctly very thick and have a 'plant-like' appearance. The nuclei have granular chromatin with small nuclei and careful examination reveals perinuclear halos in many of the cells.